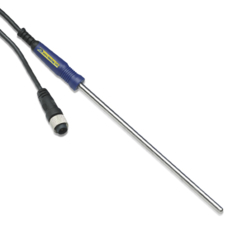 The PB-5001-1M5 is a general purpose stainless steel probe with a 1.5m cable, which monitors temperatures from -40°C to +125°C. Its moulded plastic handle and connector ensure it is robust and waterproof. The probe is suitable for damp, dusty or even submerged conditions and may be used in a wide variety of applications. This probe is also available with a 3m cable (PB-5001-3M) and a 5m cable (PB-5001-5M).